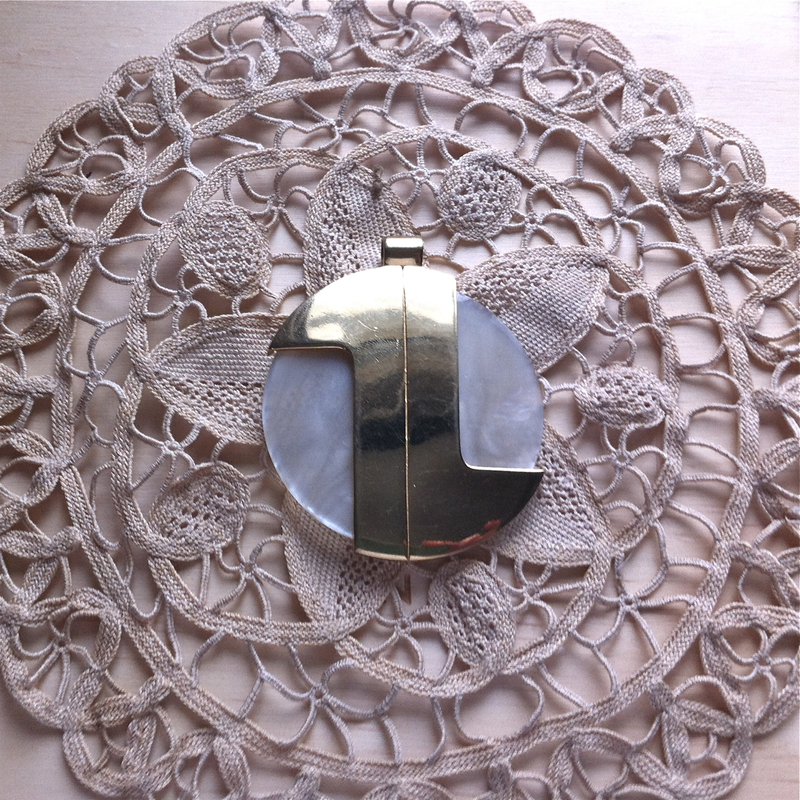 Above is an image of a 1970s pendant by Lanvin Paris. These lucite and metal statement necklaces have become very collectible over the last few years. The one picture here sold on 1st Dibs, so you know it cost at least a couple hundred bucks. 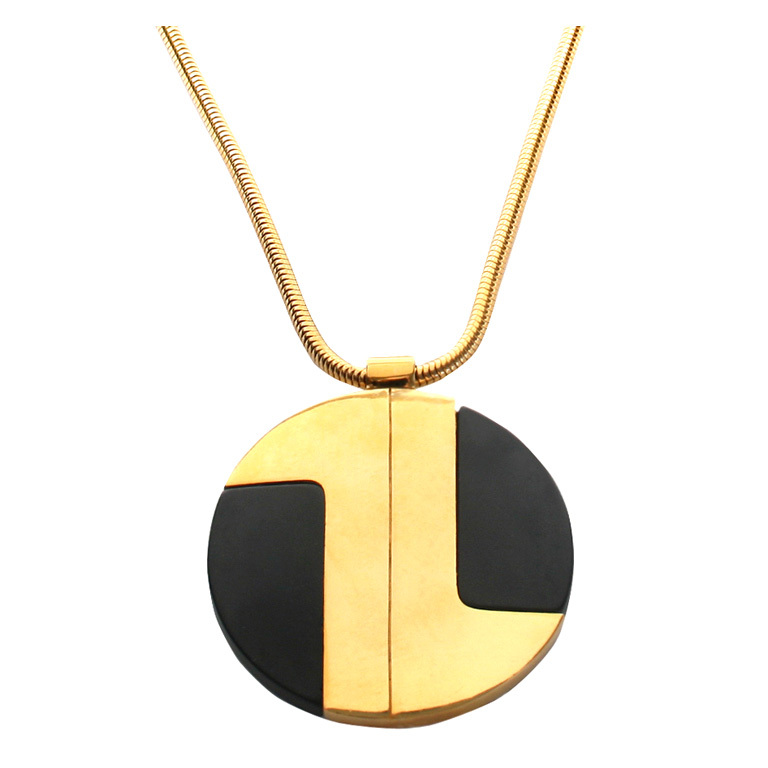 Vintage Lanvin necklaces have been highly desired for more than a couple of years now. Probably because these oversized baubles have such presence that they work with floaty boho styles just as well as they do with more minimalist designs. Which brings me to my brush with this piece: About five years ago I found this unusual metal piece marked “D’Orlan” on the back. It was obviously missing some circular bit, so I put it in the “to be repaired” box until I found a plastic disc that would fit it. By the time that happened, I misplaced the pendant. For a couple of years. But I found it on the weekend while cleaning up my office. I’m not totally happy with this marriage. I thought about having someone cast me a lucite replacement, but that would probably cost too much money. Maybe I can carve a new piece out of wood? I’m also a little intrigued about this knock off. It’s one thing to knock off a popular design of the day, It’s another thing to sign it with your own label. And it’s an exact copy — even the signature is in the same place. D’Orlan is a Canadian company, still in existence. It also manufactures jewellery for Nina Ricci. I wonder if they made the Lanvin jewellery back in the day?